Knowledge can help you in a variety of ways when you get behind the wheel of your vehicle. When towing, for instance, there are a number of do's and don'ts that you should be aware of to make the experience both easier and safer. These can and should be learned and put to use. 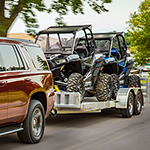 Learning the do's and don'ts of towing is a must if you anticipate ever having to pull a boat, trailer, etc. One do to be mindful of is to make sure that all parts of the trailer are functioning properly and are secured. A don't to keep in mind is to never tow more than your vehicle is rated to tow. Doing so can be dangerous for you and others on the road. If you are preparing to tow something, then it is best to make sure that your towing vehicle is in proper working condition. Come visit our used car dealership to find a new-to-you SUV or truck for sale.